Few things are more ubiquitous on the streets of Chinese cities than Ofo's bikes. The brightly colored bikeshares are everywhere — outside metro stations, down dark alleys and literally stacked in giant piles outside of office buildings. And that ubiquity is kind of the point. The Chinese don't do bikesharing the way we do in the States. They've avoided the neat rows of bike docks commonly seen on the streets of major U.S. cities in favor of a more convenient approach: basically, put the bike anywhere. In China, consumers never need to walk more than a few steps to find a bike and are never forced to find an alternative dock with an open berth to return their bikes. Users simply scan a QR code, ride off and then park the bike wherever they want when they're done. There are a lot of companies in China that offer this sort of service, but none are as ubiquitous as Ofo. The company has been a staggering success. Founded in 2014 by a 23-year-old student named Dai Wei, the company is now valued at over $2 billion and there's talk that the $3 billion mark is not far off. Their yellow-branded bikes swarm the streets, literally changing the color of traffic. 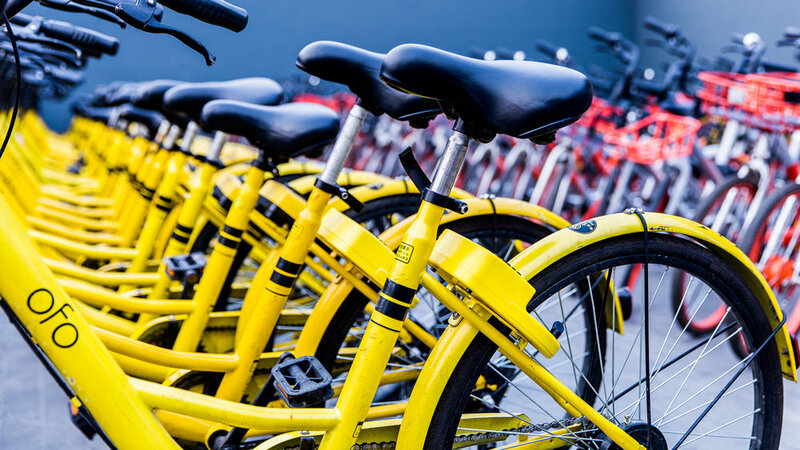 Having changed the transportation landscape in China's massive cities, Ofo is taking their game global. The company already has bikes on the streets of Seattle and Worcester, Mass, as well as cities across Europe and Asia, and is continuing to roll out to new markets. Like it or loathe it, you'll be probably be riding a bright yellow bike sometime soon. How is Ofo’s bike-sharing model different from the sorts of stationary, station-based models many cities already have? Our station-free bike-sharing service allows riders to find and park an Ofo bike more easily than the ones with fixed docking stations as long as it is within legitimate parking areas. This allows more flexibility for users as they do not need to go around looking for an available docking slot to park the bike. I’ve heard a lot about the ‘last mile problem’ can you explain how Ofo plans on solving that? In urban areas, there are places where buses and subway trains do not reach and sometimes one has to walk for 20 minutes or longer to get to the destination. It is a bit too long for walking and too short or inconvenient for taking a cab. By using a bike for the last mile, or the last 1 to 3 kilometers, it is much quicker and takes less effort. Ofo bikes are usually available in places with high demand (such as subway stations, office buildings) so that people can access them easily. Your bikes are ubiquitous in China, about how many do you have now? We have connected 10 million bikes in 180 cities across 13 countries so far. The mileage traveled on Ofo bikes keeps growing every single day. It is roughly calculated that Ofo users travel a total distance of over 21.5 million kilometers on our bikes daily. You recently launched in Seattle and Worcester, Mass, are there other U.S. cities on the horizon? We also had trial operations in the California area earlier this year. We’re still in discussions with the local authorities and will disclose our next steps when things are ready. Your expansion plans go way beyond the U.S. though, what other countries can we expect to see your bikes in 2018? We have announced our launches in 13 countries so far: China, the US, the UK, Singapore, Kazakhstan, Malaysia, Thailand, Japan, Austria, Russia, the Czech Republic, the Netherlands and Italy. By the end of 2017, we plan to reach 20 countries across the world.